Happy Cupcake Friday! You know what that means :) ! It's time for another Taylored Expressions Cupcake Challenge over on Taylor's blog (click over to play!) and it's time to introduce you to Our Friday Friend. Let's have a big round of applause for Laura Leonard (lleonard on SCS). Laura is a very enthusiastic SASI stamper and her recent creations really caught Taylor's eye. 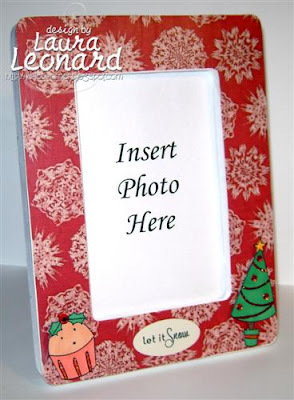 You can check out her SCS gallery here and be sure to hop over to her blog Lu-La's Corner and scroll down to see a very young SASI stamper in the making. That's what we like to see! Not only did Laura grant us a sweet interview, but she decided to create some brand new projects to share with our SASI readers on the blog today. 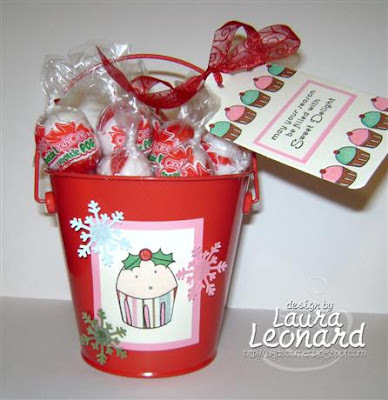 So check out her adorable pail filled with yummy candy cane tootsie pops and her fun Winter picture frame while you also enjoy a little get-to-know-you time. 1) What city/state do you live in? I live in Plainfield, Illinois which is about 35 miles Southwest of Chi-Town (Chicago). GO BEARS!!! 2) How did you become addicted to papercrafts? How long have you been stamping? About two and a half years ago I was desperate to find a hobby; something to do for "me". With a husband, two daughters, and a full-time job outside of the home, it was a MUST. I kept hearing my girlfriend Michele talk about going to "stamp camp" every month and finally decided to ask if I could join her. Well, as most of you know, the rest was history...LOL! I became addicted immediately and have been stamping ever since. 3) How would you describe your style? What are your favorite projects to create? Ya know, I don't think I've ever really given my style any thought until this question...LOL! I would have to go with cutesy and I love using bright colors. I've never really created a lot of projects; I've always just been into making cards. I do, however, like to make anything that can hold a small gift. And, with the holidays upon us (and money tight), I hope to experiment a little bit more with that. 4) Do you have a favorite SASI image? That's like asking if I have a favorite child...LOL? This is a REALLY hard question to answer, but if I HAD to choose one favorite SASI image it would have to be the cupcake on the ladder blowing out the candles from the Sweet Celebration set. 5) What is your favorite sweet treat? I would have to say that my favorite sweet treat is Tiramisu. Since I'm not really a "baker", I am sharing a very easy Tiramisu recipe. Thanks Laura for the yummy recipe and the yummy creations! What a great gift set. Love the cute tag and the sparkle! TFS! Congrats on being the Friday Friend. Sweet projects! So cute and festive! Congratulations! What a great gift set!